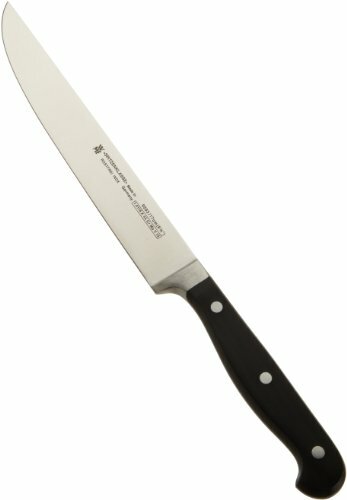 Carving and serving meat just got easier with this WMF Spitzenklasse carving knife. This knife is perfectly designed for cutting and carving raw or roasted meat. The blade of the carving knife ensures a firm, clean cut of the meat fibers and prevents the loss of valuable juices when carving. This knife can also be used for cutting small amounts, or cutting cubes or strips of meat. WMF Spitzenklasse is a classic collection, with knife blades made from special forged blade steel that is extremely hard, robust and rust-free, guaranteeing high cutting capability and presisting edge retention over the entire blade length. The riveted grip caps are made from durable, high quality special plastic that joins seamlessly with the blade, while the adequate bolsters help balance the knives and protect hands from accidental slips across the blade. The tang provides additional balance, making these knives great performers. Up to 45 production steps guarantee perfect workmanship with these knives, once again underscoring WMF's commitment to bringing you the highest quality products for the kitchen and home.